I call myself a quilter, but in recent years, I’ve been one more in spirit than in action, sewing only when I got together with my quilting buddies (and sometimes not even then&dash;at one gathering I knit and another worked on a photo album). After I finished the baby quilts for my grandnieces in summer of 2012, I pretty much lost my groove. I let quilting magazines pile up unread. I barely set foot into fabric stores and wasn’t at all bothered by missing the latest designs. I ignored my quilting to do list. Until this past weekend, when I finished the quilt top I made at the retreat last month. What inspired this burst of productivity? I’d donated the quilt to the Weetacon charity raffle. Sure, it was just a top when I donated it, but I had faith in myself that I could finish it in the week and a half between when I sent in the information and when I had to leave for Wisconsin (okay, maybe I did entertain a few thoughts of finishing the binding by hand the night before the raffle, or even giving the winner an IOU and shipping the completed quilt later). I did finish it, and didn’t even have to break my self-imposed “no sewing after 9 p.m. ” rule to do it. 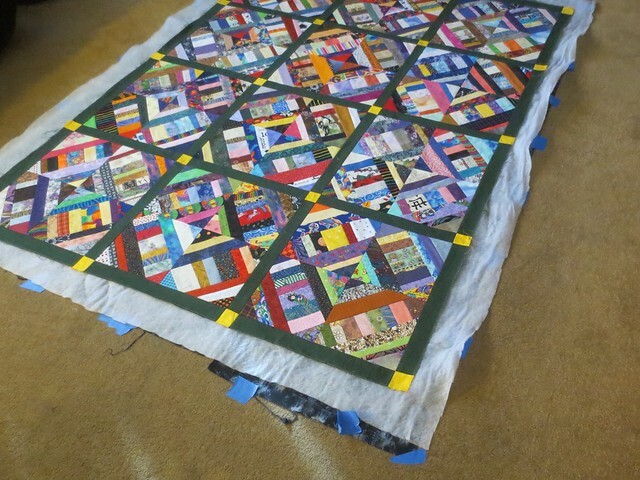 This work won’t pass muster with the quilt police—some of the sashing cornerstones are wonky, and it lacks a proper binding, much less a proper bias binding, and the quilting lines are very wobbly in some areas, and some of the fabric is washed and some not, and so on. Too bad. 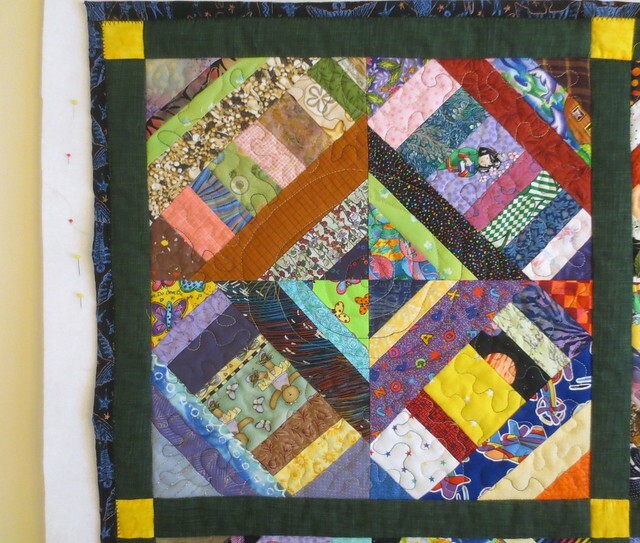 The quilting police will just have to deal, because I like it. I like it so much I want to keep it even though I know I can’t, that it’s going to raise money for good causes. 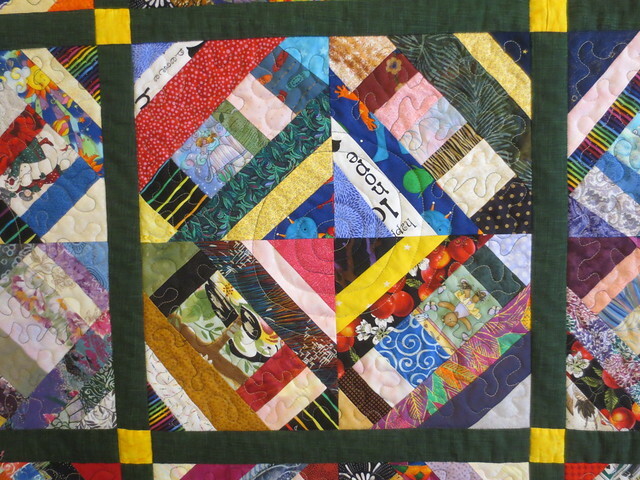 I can make another quilt with blocks like this, which incorporate scraps from my quilting projects as well as those of my friends. Whomever wins this won’t have the same connection with the fabrics in the blocks that I do, and that’s okay. They’ll make their own associations with the quilt, and I’ll have photos to remember it by. One thing I like about this quilt is the “I Spy” potential. There are a lot of scraps in here with recognizable objects on them, perfect for a game to entertain the young and young at heart. 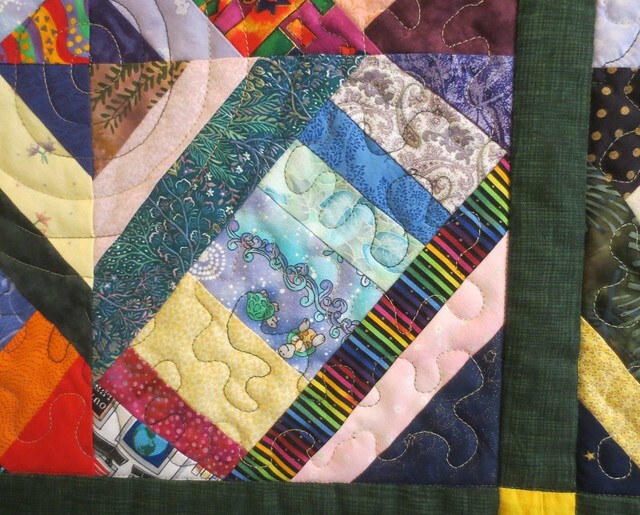 I spy ballerina bears and butterflies and dolphins and planes and Easter eggs and birdseed and a girl and a planet and stars—and that’s just in one corner of the quilt. Other blocks have a zebra, a robot, an otter, cats, an angel, a snowman, the sun, a toucan, cherries, aliens, computers, an elephant, whales, sock monkeys, boats, a soccer ball, ladybugs, turtles, and more. 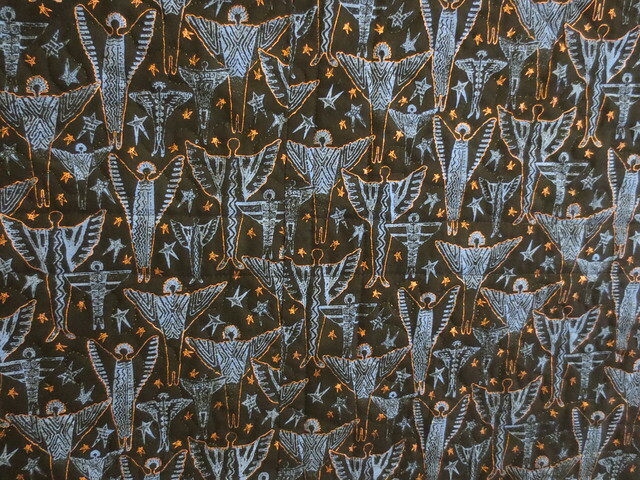 I chose the backing by looking at what I had enough yardage of and what would be easiest to have a single color of bobbin thread blend into, which led me to this black printed with blue angels accented with copper. I rather liked the symbolism of a tribe of angels, too, so that was a bonus. I had to piece it to get it wide enough, and I’m pretty sure I didn’t do that in any standard way, since I made no attempt to balance where the seams fell. Hey, that’s just added character. I used fusible batting, as has become my wont in recent years, though it had been so long since I last got this far that the brand I used to use no longer seems to be sold at JoAnn; fortunately there was something similar available. 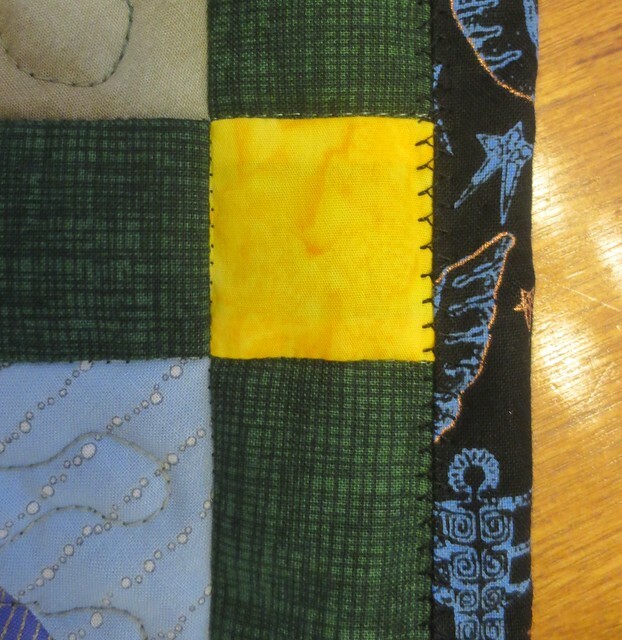 When it came time to do the quilting, I first stabilized along the sashing. I did this with some Guterman transparent thread I’d bought when I got the batting, since I knew I’d run out of the stuff I had been using that was made specifically for quilting. I thought transparent was the way to go since there were so many colors in the scraps I was quilting across and I wanted them to show, not the quilting thread. That was a good idea, and has worked for me in the past, but this particular transparent thread was not well behaved and kept breaking on me. It felt less flexible than the stuff I used to use, so I need to figure out where I got that stuff and get more. Given the problems with the transparent thread, I didn’t want to use it for quilting the blocks, so I switched to some variegated cotton/poly thread in shades of tan and green that I had in my stash. I chose that one since it tied in with the green of the sashing. I wanted the quilting to enhance the center where each of the four block sets came together, so I started with a spiral from the middle, switching to loose stippling to fill out the corners about when the spiral hit the first point at which the direction of the strips changed in the blocks. It’s been a long time since I’ve done any free motion quilting, so my lines waver more than I’d like; I’m counting on all the variety in the scraps to distract from that. I finished the edges by bringing the folding the edge of the backing and bringing it around to the front, securing it with one of the decorative stitches built into my machine (or maybe it’s one of the functional stitches that also looks decorative; I’m not sure where the line is there). 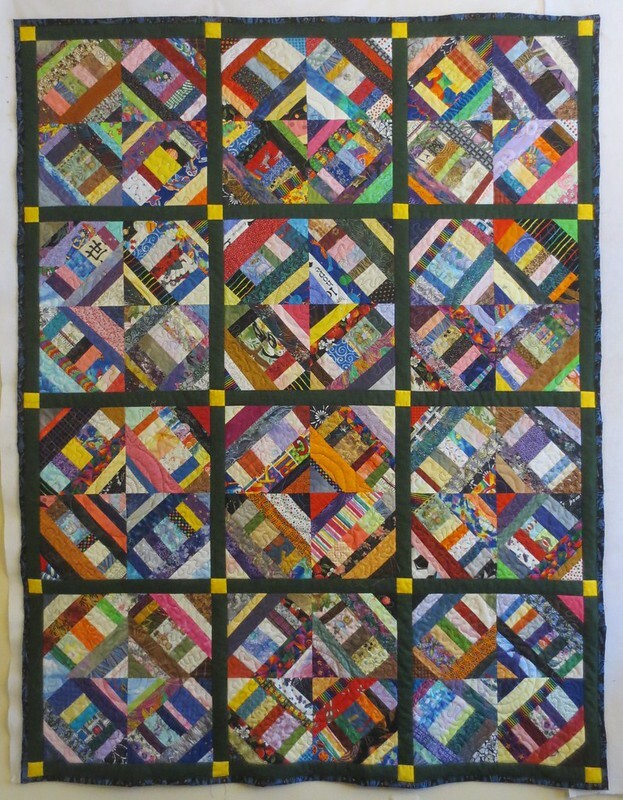 All in all, this is not my most technically well done quilt, but there’s a lot of good feeling worked in with the stitches, as I created it mostly in the company of friends or thinking about the group of friends the finished quilt would find a home with after the raffle.